Arata has started his primary school. In the end, we chose the easiest option for our family. 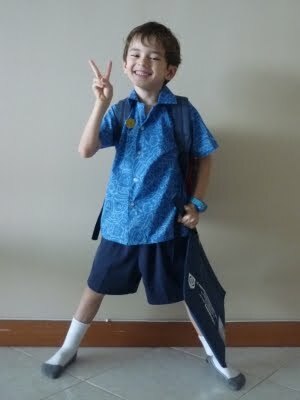 He goes to SCIPS, British international school. There are 2 teachers for 24 children. The new school building has just completed. Good timing. Arata was on the school bus from the day one. In the first 2 days, I saw him off, then drove to school first to wait for him, then took him to his classroom. But within less than a week, he got used to the routine. There are quite a lot children from the same condominium and some of the older children are so kind to him. It was so good for him to settle in. I was quite surprised to see the classroom of year 1. They have a couple of round tables, no assigned desk for a kid, children sit on the floor to listen to the teacher.... Not much different from kindergartens. 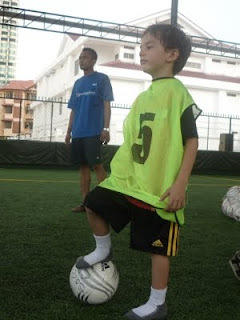 I expected and wanted him to learn lots from now as we let him play till now at Taska Nania. Probably it must be like this in primary schools in the U.K. Different from Chinese or Japanese schools. I had worried too much about Arata missing his reception year, or the first term of Year 1. But I think I shouldn't have worried that much. It must be easy to catch up with other children, although Arata's spelling and reading is poor at the moment. The school doesn't seem to put too much pressure on kids, which is good for the start. Another big issue for me - preparing lunch for Arata. Well, I was too depressed with the idea that I eventually had to start preparing lunch boxes. I was so stressful, Jason offered to make sandwiches for Arata every day. Arata came home on the first day and said to us, "The sandwich was not nice, and other children had much bigger lunch boxes!" That's it. Jason gave me the green light to go for lunch delivery service, which is the service lots of parents are using at SCIPS. One more thing for Arata. He started football with other kids. It's once a week lesson by a local football coach. He really enjoys it and getting better each time he attends. Happy New Year to you all! Thankyou for your Christmas card which just arrived last week. Arata and Oliver are growing up fast. Love this photo of Arata. Ben started at the secondary school last September and Daniel is now year 2.